Frank said he'd take me out to a local coffee shop for our first date. We met in front of it and he went to push open the door. He shoved it with both hands. He stepped back and looked at the store hours. Yep. They were open. He looked inside. People were in there! He pushed again. He leaned against it. He banged on the door. He kicked at it. Then again. "Stop!" I said, my concern for the door outweighing my amusement, "You have to pull it open." Indeed, that's all Frank had to do. He yanked the door open and trundled within. All eyes were on us as we sat down. As for the date part of the date itself, Frank took turns grumbling incoherently and shooting dark looks at the door that had bested him. We didn't talk much, and for that I'm glad. It was our only date. Bananas will be all like "ermahgerd, what is that cartoon?! I simply must read it!" I actually had the link ready before I looked to see if you had posted it first. This guy wasn't so awful he just clearly took some things WAY too seriously. It's a door. You pushed instead of pulled. Laugh it off and move on. It's only filtering the gene pool if the door had kicked him in the nuts. Hard. 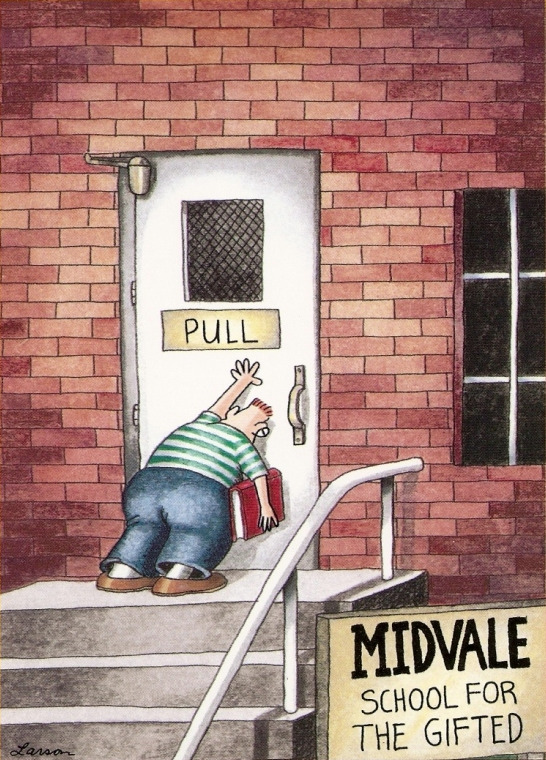 I'd guess that most people at one point have pushed a door that sas pull. I've done it quite a bit... But this bone head was being especially stubborn about such a simple thing. I'd hate to see what he'd be like about other things. "Frank, that's the wrong hole....Frank....FRANK! Goddamnit FRANK!"